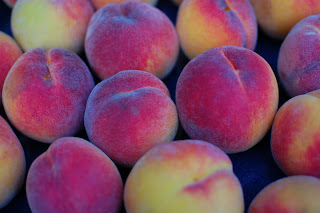 These beautiful and delicious peaches were collected from a friend's backyard, here in Seattle. The poor tree was groaning under the weight of a bumper crop. Also collected were a fair number of overripe yellow plums. T preserved them yesterday into a plum-ginger-lemon conserve, which she says were amazing on this morning's waffles.